Houston, we have a temperature problem | Watts Up With That? Eric Berger writes (excerpt below) at the Houston Chronicle “SciGuy” blog about the wicked hot record breaking temperatures people were getting in Houston on their iPhones. Turns out the whole issue is over station siting. While he located the station, doing some further investigation, I’ve got shots of the actual equipment and error analysis. Over the last several days I have seen a lot of reports on Twitter and elsewhere about very warm temperatures in Houston, a few degrees warmer than those being reported by the National Weather Service. They have come from people with iPhones. For example the “Houston” location on your iPhone’s generic weather app reported a temperature of 109 degrees yesterday at 2:50 p.m. when in fact the official reading at Bush Intercontinental Airport at the time was 105. Indeed no major weather station in the Houston area reported such a high temperature at the time. It got TechBlog‘s Dwight Silverman and I wondering what was going on. Where was Apple pulling this data from? We started speculating on Twitter and didn’t begin to solve the mystery until Travis Tubbs chimed in. So the mystery was solved, sort of. Apple gets its weather data from Yahoo!, which in turn gets it from The Weather Channel. 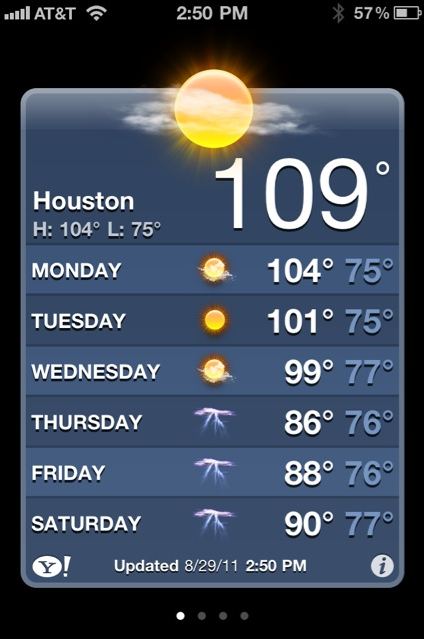 And for whatever reason the default iPhone weather data point is the Houston/Hermann Medical Center weather location. Whatever that is. It’s not an official National Weather Service site. No, it isn’t an official NOAA station, it serves the heliport. But it is a MADIS station, registered with NOAA, and used for other purposes such as MESONET. 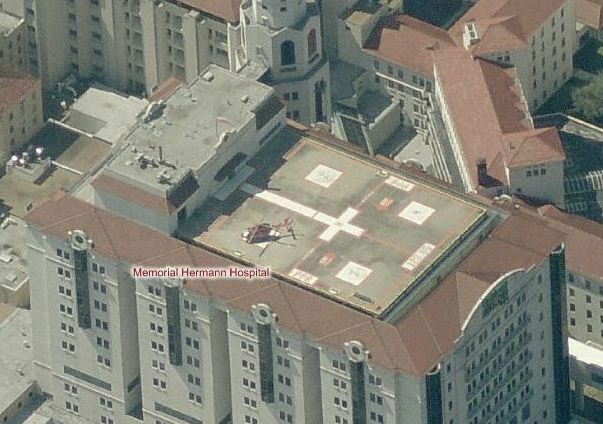 Clearly the lat/lon places it on the roof in the helipad, but even at max zoom, I can’t make out any weather station. I was however able to see a helicopter on the pad and a windsock on the Bing Maps image and I theorized the weather station might share the mast with the windsock. If you enlarge the photo, you’ll see the anemometer and wind vane, and what looks like a gill shield for the thermometer, though I can’t be certain. 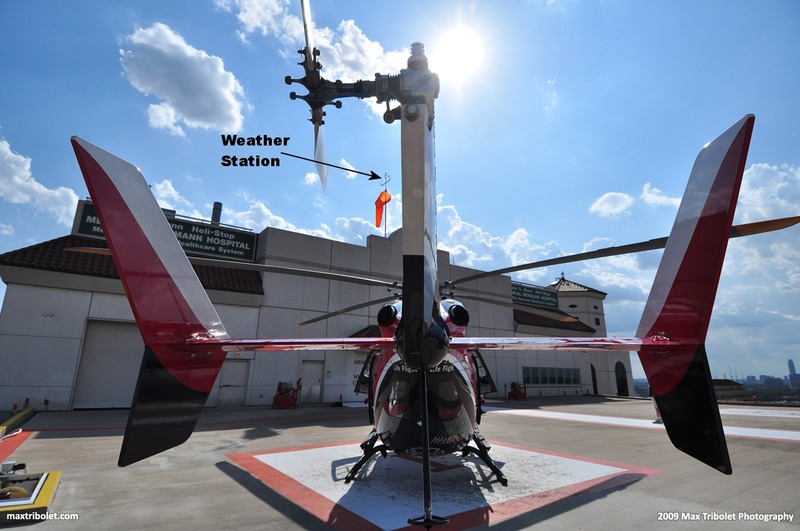 Even if it isn’t, the thermometer will be nearby to serve the helipad. What I found most interesting though was the temperature analysis provided by the NOAA MADIS website. Apparently the problems with this station are well known. Worst daytime temperature error of 6.5F …wow. Your readings indicate a solar heating problem. This means that the sun can shine directly onto the temperature sensor (or it’s housing) and increase the temperature recorded significantly. This is often caused by the lack of a radiation shield, or the sensor is poorly sited. For information on radiation shields, see CWOP Radiation Shields, and information on siting, see CWOP Station Guide. With error magnitudes like that, perhaps the Weather Channel Might want to use a different source of station data for reporting Houston temperatures. Again, siting is the issue. 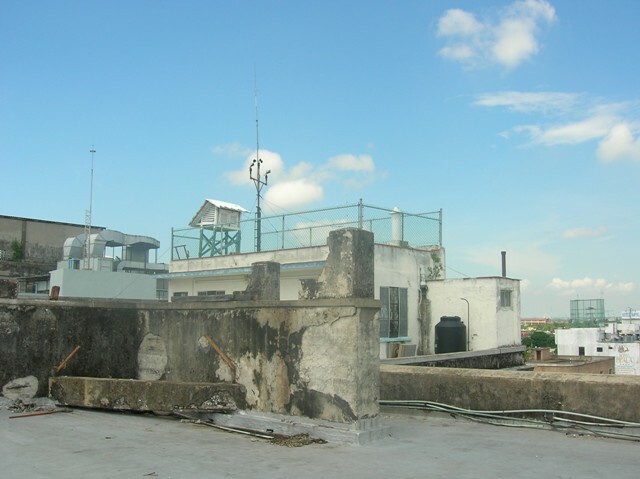 The station might be fine for reporting helipad conditions, and it might very well be that hot of the roof of that building. Knowing that accurately is important for the safety of the helicrew, especially on days of high humidity and high density altitude that sap rotor lift efficiency. As we’ve seen time and again, GHCN stations are often sited at airports, and while runway and helipad conditions are imperative to know, especially when they differ from surrounding ambient, such stations sited in odd places don’t translate well for other applications, be it long term climate monitoring or a simple iPhone app for infotainment purposes. If people reading iPhones can spot such problems and know the temperature data isn’t valid, and a citizen run CWOP program can use MADIS analysis of the data sight unseen and note it’s FUBAR, why can’t our meteorological experts at The Weather Channel figure it out? – that you can get the temperature real time? – that you can investigate the cause without ever getting off your seat when in past eras it would have been virtually impossible to check without scaling a nearby building. – that I can sit in Scotland, reading about a problem with a temperature sensor in Houston, and be read by some person in Australia within minutes? The first thing I tell any friend who gets an iPhone here in Australia is to ditch the weather app and get an Australian one. The standard app is totally inaccurate. Maybe the date line thing throws it out? When I want to know what the weather/temperature is like, I go out side and have a look/feel. Apparently the northern half of Aus had its coldest winter in over 30 years, but the south east was warmer than average, which of cource is a meaningless term. Coldest summer in eighteen years over here in the UK (according to the Met Office yesterday), also wetter than average (though parts of the UK were drier) and nearly 25% duller. Good job they got out of the BBQ forecasting business! Folks are wondering where the summer went. Coldest summer since 1996 in Germany (according to DWD, Deutscher Wetterdienst; they’re strictly on warmist message and love to point out that it’s still “too warm”, meaning above the long-term mean (i don’t know if that means a 30 year mean or a 200 year mean)). If the Weather Channel won’t site their stations more accurately perhaps they could at least include a disclaimer. Good work Anthony et al. Great analysis Anthony – its amazing how you pull all of this stuff together… I feel cooler already ! Same thing with the Acy record high in 1969 (106) .. there was no station within 100 miles over 100 degrees, yet they let it stand. This year at least there were west winds and a broiling heat wave. At the time I took instrumentation at PSU (1978), a torturous course that gave me nightmares since we had to build and calibrate instruments ( I would have never taken the course, but had to my last term instead of optics, which was mainly cloud identification)..the whole class was grad students that were so smart, then did not have to talk but communicate in vulcan mind meld.. the one thing I did pick up is that most of the time a thermometers error bias would be to read TOO WARM . Its very very hard to get it to read too cold unless there is simply an instrument malfunction. IN other words the too warm readings can be caused by nonsense like this ( locating a thermometer on a roof,, the accumulation of dust on the thermometer and many many other things that if there was a book on this in bible, it would be the Book of Watts. I was in Houston for the record tying day.. It was darn hot, but even my car thermometer was only at 108.. and that of course reads warm sitting in traffic. BTW the Houston Sci Guy, Eric Berger, really has an outstanding blog. Its a go to one for alot of things. I have no idea of Erics politics but I do think some of the science magazines out there could use someone like this as he really does a great job.. and he will be the first to tell you he is not a registered member of my fan club.. no matter, I call em as I see em though, the guy is great and from weather through health and a bunch of other matters, this is the best there is. That’s the same machine that they use for climate modelling………..
We don’t mind record 109 degree temps here in Houston because we always stay indoors with our air conditioning set to a comfortable 84 degrees. Perhaps they were saying you would need to fire up the barbeque in order to stay warm. I live in Houston and ride a motorcycle around town. I can tell you without a doubt it is and has been a bazillion degrees here with no appreciable rain for a millenia. God’s honest truth…. Important note to keep in mind with regards to roof top measurements. Generally, in multi-story building design/construction, the mechanical equipment room will be located on the roof. That would appear to be the case here. This is where the HVAC equipment is usually located and includes the heat exchangers for cooling in the refridgeration cycle equipment, thus releasing a lot of hot air. Many buildings will require cooling even in moderately cool outside temps due to internal heat loads from lighting, computers, appliances, people, cooking, solar gain, etc. To give an idea of the amount of heat released, compare to your compresser/condenser unit for central air at your house (the unit situated outside your house) and multiply it to the size of this hospital. Add the internal heat loads and …. well you get the idea. In January 2010 we were stuck in Spain due to the closure of Newcastle upon Tyne airport by snow. I was in contact with family here and colleagues at work. I was monitoring temperatures back home to see if a thaw was imminent, Weather channel were consistently saying minimum temperatures were -2 – 0 celsius. Our home weather station was saying -6 – -8 and colleagues at work said that their car thermometers agreed with our home weather station. I don’t know where the official weather station is situated, but we only live 5 miles away from the airport and about 6 miles from the city centre. The temperature difference is huge as was the misinformation. Incidentally with just a few hours to go UK has officially had the coldest summer for 18 years, in Northern ireland it has been the coldest for 31 years. I am typing this at home on my lunch break. The outside temperature is 13.5 celsius, our sensor is just outside the front door (North facing) so I would expect it to register 0.5 degrees too high because of the ambient heat from the house. We definitely need some global warming!! The iPhone weather app wants to accomoate you for whatever your location is. When I saw that the iPhone app temperature was consistently high I started checking around the area and found they were using the closest ‘official’ station 10 miles (and down in elevation) from where our town is located. I did complain the tempurature was usually not correct and after awhile it got better. I don’t know what (or if) they did, but hey it’s just for amusement anyway. I find it easier to look at that app than the TWC iPhone app. I am sitting in my office in one of the hospitals next door to the MH. I am wearing a sweater as the temperature is 69.5; all the hospitals in the Texas Medical center maintain the temperature at 70 degrees, as it cuts down on infections. 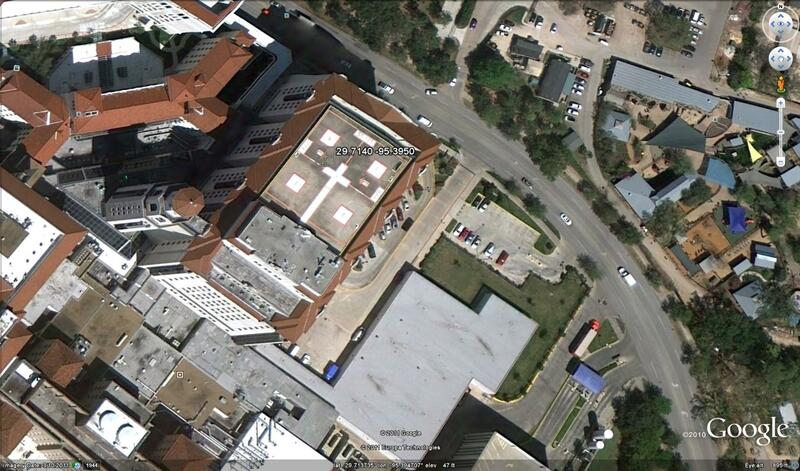 The hospitals at the TMC are clustered together, are modern concrete and glass, and are serviced by very busy roads. I cycle to and from work, cutting through Rice University. You can physically feel the change in temperature when you cross Main Street, which separates the Tarmac/concrete of the TMC to the grass of the Rice campus. You can do the same thing if you exit the TMC at Ben Taub Hospital, crossing Cambridge St to the Zoo/Golf course. I know one of the A/C guys would sometimes has a smoke on the sidewalk with us tobacco fiends. When he has been on the roof he is bathed on sweat. I agree with JB. Eric Berger is pretty good as the science/weather writer for the Houston Chronicle. I get the impression that he is a bit of a warmist but not completely there. That is, he tends to be open to discussion. As for his politics, I have no idea. He’s a writer for a major daily. Take from that what you will. But I like the guy. I have corresponded with him on several occassions over the last few years, and he always responds with intelligence and good humor. His SciGuy blog is usually entertaining and always educational. Oh, and when hurricanes are on the way, his blog is an excellent source for folks in the Houston area. The Weather Channel probably knows all about this poorly sited station and chose it for the purpose of enhancing the “warming signal” in the minds of those who use the app. The Weather Channel has been on the warmist propaganda sheet for years, and I only use them for the current radar when at work. (Can’t really download many apps on my work pc.) I should probably switch over to the National Weather Service page though or the local tv station’s local radar feed. I draw the conclusion that some people are never satisfied, 107 is hot enough I think! since he knew they were true. Thus their high-reading thermometers are merely being prophetic. Who cares about scientific truth when growing govt is the objective? that I can sit in Scotland, reading about a problem with a temperature sensor in Houston, and be read by some person in Australia within minutes? I think someone should mention that Houston sits in a hole. The “Houston Ship Turning Basin” is on the edge of downtown. It is for ocean going ships. Cities that sit in holes, such as St. Louis MO on the Mississippi River, suffer disproportionately from UHI. It has been what I call “an air conditioned summer” here in Greece at the Corinth area. 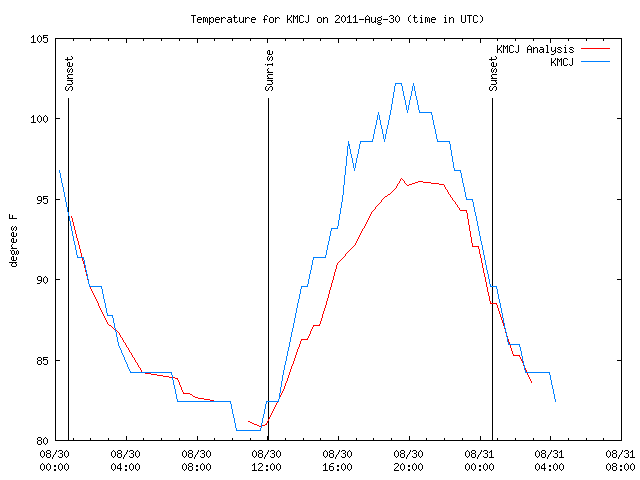 I have a plot of temperatures, and they never went over 36C . Most of the time around 32C with fair breezes blowing, Very pleasant, On hot years we have hit 40C and once 42C. Theo, I’m not sure what you mean by “a hole”, but given the general lack of any topography in this coastal plain (old sea bed, by the way), it’s hard to characterize Houston as being in a hole. The elevation in Houston is around 50 feet above MSL, and varies only by a few feet throughout the area (discounting the cuts by creeks and bayous). And it’s ~50 miles to the Gulf of Mexico, so there is a very, very shallow decline in elevation. Thus, rain runoff is very slow, and a foot or two difference in elevation can determine whether an area floods. It’s so flat, that the Soap Box Derby has to commandeer highway overpasses for their competitions. Not a bad idea, but instead of Hermann Park, why not Memorial Park? Granted it’s been a few years since I was last in Houston, but I recall Memorial being more “natural” than Hermann. Or as natural as an urban park can be. I used to read Eric’s blog, but I don’t anymore. He is a completely biased AGW advocate although he claims he is undecided. (He’s lying.) As with most watermellons, he’s also a misanthrope. OK, “hole” was too much. It is a short walk from downtown to sea level. Also, the metropolitan area is not strung along a coast as Miami is. It stretches northwest, north, and northeast, preventing it from getting the benefit of the sea breeze. Why can’t our meteorological experts at The Weather Channel figure it out? The NWS does a much better job. Memorial Park would be a much better site. It’s much larger, mostly forested, and probably would shield the site from UHI somewhat, but not entirely. I’d probably put it near one of the baseball or soccer fields. As far as rainfall runoff goes (my day job), Houston is pretty darn flat. It’s hard to design drainage systems, because we get so much rain and there’s nowhere to put it. That, combined with the clay soils that don’t soak anything up, means that we have to dig huge holes to offset increases in runoff from development (a good thing to do, but expensive), and ofttimes we have to pump the water out of the holes, because it’s cheaper than digging a much shallower hole that would gravity drain (and you can’t run an 8′ deep storm sewer system into a 3′ deep pond, anyway). This is ridiculous. An entire city 50 miles wide and 50 miles long being read from a single thermomenter on top of a hospital not 2 miles from my old apartment. That area is nearly treeless, completely waterless (well, there is a nearby park, but it’s nothing compared to the East side which is covered in trees and has the Ship Channel going all the way up to downtown), has horrific traffic, and is smack dab in downtown’s heat island. Sometimes it seems they break a record a day, every day (for past year, winter AND summer). I have zero evidence but the climate reporting looks wacko in Waco. “Only two things are infinite, the universe and human stupidity, and I’m not sure about the former.” – Einstein.